During Bike Week LA, we collected nominations for the Golden Pedal Awards, Metro’s annual competition for great stories about bicycling. 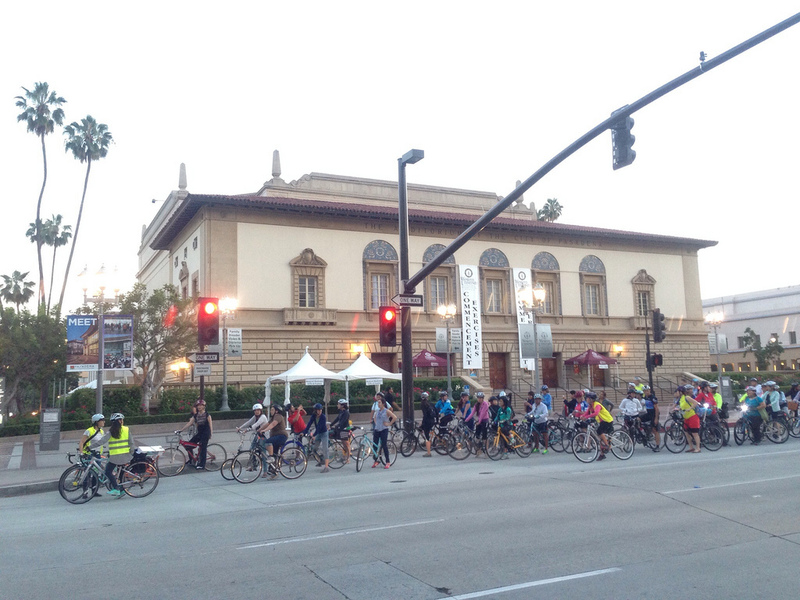 We’re featuring these stories in a Why You Ride series – because for many Angelenos, every week is Bike Week! Maria Sipin was nominated by her sister Andrea for maintaining an impeccable standard of style on her 10-mile bicycle commute to and from the Metrolink station every day — “Not only does she ride in her chambray dress and ballet flats with ease, but she makes helmet hair disappear instantly,” Andrea told us. We’ve always been impressed by Maria’s ability to integrate her passion for bicycling — she is a certified League Cycling Instructor and a bicycle advocate with the Pomona Valley Bicycle Coalition — with her work as a disease prevention specialist at Children’s Hospital Los Angeles (CHLA), where she encourages youth to bicycle for health and independence. 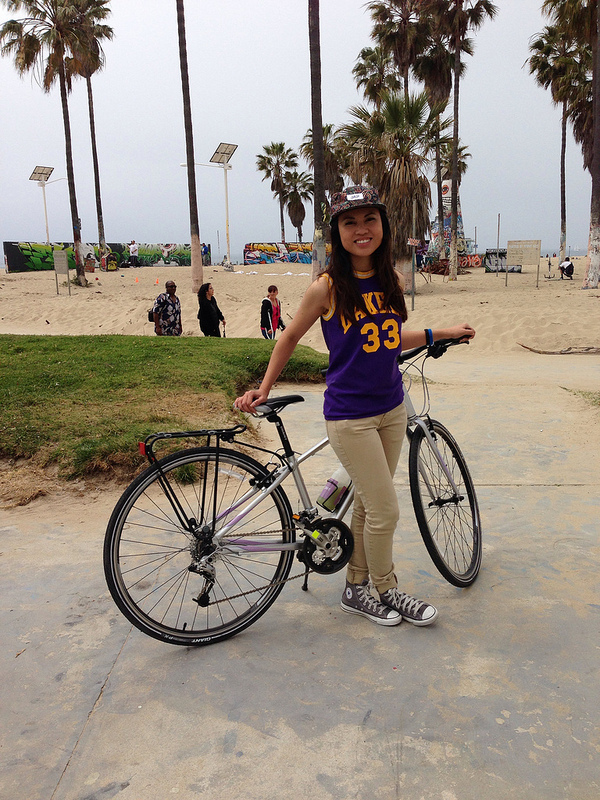 Maria and her hybrid city bicycle at CicLAvia to the Sea in April. Maria tells us more about her bike advocacy (and shares some fashion tips with us — we can always use those at Metro) after the jump. How long have you been riding a bike? How did you commute before you started biking? What made you decide to ride? How often do you bike to the Metrolink station now? What is it like taking Metrolink with your bicycle? What is your bike like? What equipment has made your commute easier? Do you ride outside of your commute? Could you discuss your work at CHLA a little bit? Why are you such an advocate for bicycling? What have you learned from your bicycling experience and incorporated into your work? Maria leads a group ride for women with C.I.C.L.E. during Bike Week Pasadena. If she’s wearing a safety vest and helmet, you know they must be cool. Do you have a favorite bike path or lane in LA? Thanks Maria for sharing with us! We appreciate all the advocacy work you do in our communities. We’ve sent you a box of Clif Bars, a year of bicycle roadside assistance from Better World Club, and a Nathan reflective safety vest — we bet if you start wearing the safety vest, everyone else will want one too! Bike riding in Los Angeles can be a very good idea but it’s also not the safest way to travel especially on busy streets. While bike lanes sound like a good idea it places the bike rider to close to parked cars with the possibility of car doors being opened in front of the bike and the rider falling into the street and maybe being hit by a passing vehicle. Also bike riders MUST stay aware of their surroundings. The legal width of most vehicles are 96 inches but a transit bus is 102 inches wide maneuvering down a traffic lane designed for a 96 inch wide vehicle. Bike riders weaving in and out of lanes or in a bike lane weaving from side to side is dangerous. Also for some reason some bike riders choose to ride against traffic. This is also a unsafe act. Yes, you have the right to ride in the street and share the lanes but you don’t have the right to make it unsafe for others. I have had more than one contact with a bike advocate who in fact posted lies about an incident I and both the LAPD and LASD were associated with. Not only was he a danger to other motorists but on more than one occasion delayed MTA service by blocking buses. What’s was his biggest complaint? A bus operator tooting their horn per MTA safety instructions while passing him and his fellow riders on the road.